Final Cut Pro X Plugin Creator, Pixel Film Studios, announced the release of TransWipe Volume 3. This FCPX Transition pack comes with over 30 presets ans has a simplistic style. TransWipe Volume 3 is a set of 30 professional transition animations created for use in Final Cut Pro X. Drag and drop a TransWipe preset between two video clips to instantly add a unique transition to any Final Cut Pro X project. Choose from smooth corner wipes to colored panels with customizable color and orientation options. TransWipe Volume 3 is a Final Cut Pro X exclusive plugin. TransWipe Vol. 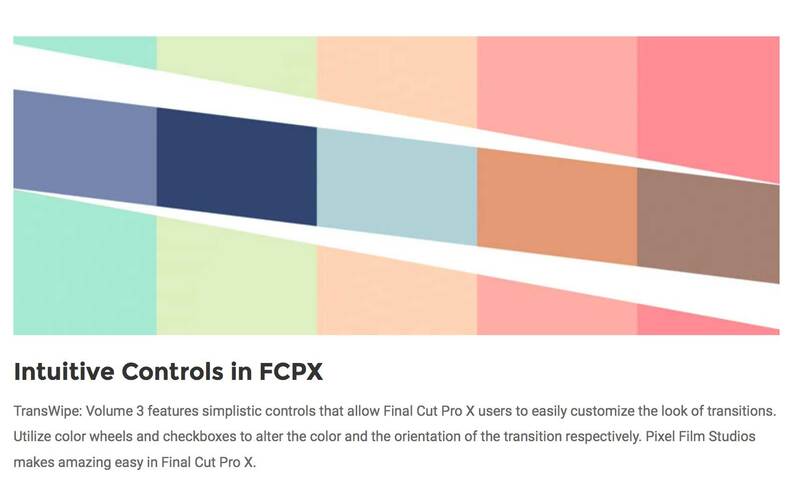 3 features 30 professionally designed transitions that are completely customizable in Final Cut Pro X. Easily create a seamless transitions by simply dragging a TransWipe between two video clips. 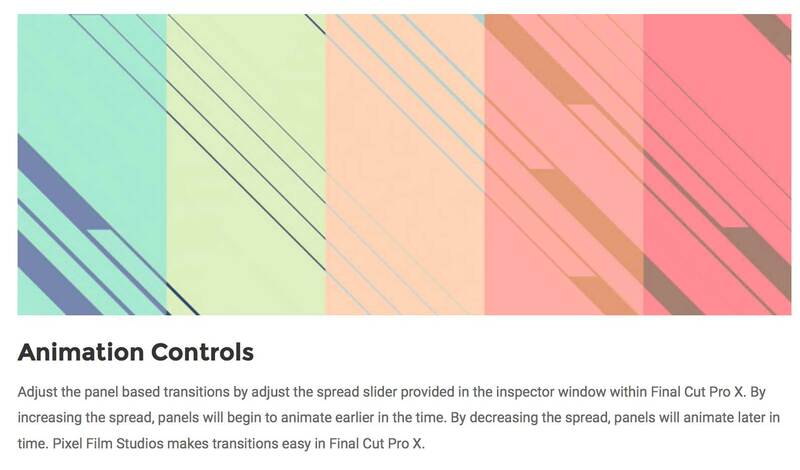 Adjust the speed of transitions by stretching or shrinking the size of the transition in the FCPX timeline. TransWipe Volume 3 features simplistic controls that allow Final Cut Pro X users to easily customize the look of transitions. Utilize color wheels and checkboxes to alter the color and the orientation of the transition respectively. TransWipe Volume 3’s simplistic style makes it an effective transition for almost any Final Cut Pro X production. Utilize TransWipe in high-energy productions, video montages, or youtube blogs. Easily add a kinetic transition with a complementary color accent in between scenes in Final Cut Pro X. Adjust the panel based transitions by adjust the spread slider provided in the inspector window within Final Cut Pro X. By increasing the spread, panels will begin to animate earlier in the time. By decreasing the spread, panels will animate later in time. 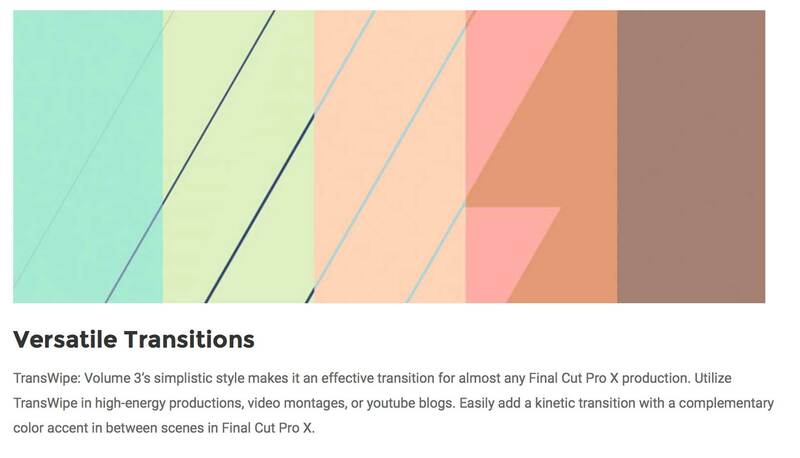 Pixel Film Studios makes transitions easy in Final Cut Pro X.